Call for applications will be open from March 1st until April 15th. Summer Camp 2018 will start the 13th and end the 22nd of July. 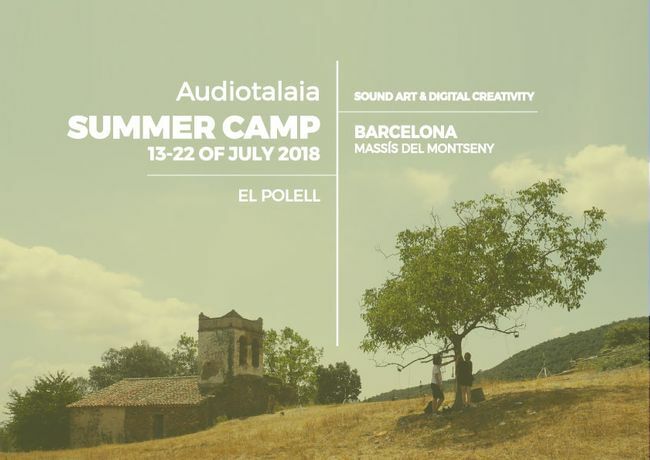 The Audiotalaia Summer Camp is a 9 days sound art and digital creativity workshop and a residency program happening every summer since 2016 at the heart of the Catalan Countryside, on a privileged location surrounded by nature. The Audiotalaia Summer Camp is already in its third edition. This is a 9 days workshop and a residency program happening every summer since 2016 at the heart of the Catalan Countryside, on a privileged location surrounded by nature. The Third edition of the Summer Camp takes place at El Polell, a cottage house at the outskirts of Barcelona. The house is prepared for long term educational programs and its fully prepared to host a group of 15 people. During the 9 days residency and workshop participants from all over the world will share, work and explore together the creative possibilities of sound art, field recordings and digital arts as a framework. The workshop will focus the attention on the relationship between soundscape, landscape, technology, and specially the act of listening our environment. The workshop wants to serve as a starting point to introduce the participants into all the creative possibilities of sound from a wide range of perspectives. From a musical point of view through narrative, composition, documentary, phonography all through the prism of field recordings and its relationship with the landscape and the natural environment. The Summer Camp includes lecturing hours, a microphone workshop and several outdoor activities ranging from deep listening exercises, field recordings campaigns, the development of sound installations, live performances and site-specific interventions in the natural surroundings. By the end of the Camp, the participants will work together towards a public presentation of their work during the stay. This activity will invite local audience into an open evening dedicated to sound art, experimental music inspired by the surrounding landscape and territory. All lecture and practical activities will be conducted and tutored by Edu Comelles. The full program and schedule of activities will be issued in detail once the participants have been selected. The Summer Camp is divided in two main stages. The first stage focused on lecturing, tutored activities and practical workshops will span the firsts days of the stay. The time in those days will be split in lecture hours, happening in the morning, in which to establish the grounds of the subjects that will be put in practice during the day. After that, a big percentage of the day is meant to be dedicated to practical and workshop activities. By the end of the day a small period of time after dinner will be set for public presentations held by participants sharing ideas, pitching projects or presenting their personal work to their companions. Within all of the above, a DiY microphone workshop will be held providing all the participants with a basic microphone kit with Binaural and Contact microphones. The second stage of the Summer Camp will be dedicated to development, production and rehearsing of the final presentations taking place the last evening of the Camp. During this last days, the participants must order, plan and finish a work done collectively. Different materials, human and technical resources will be provided in order to deliver the works that will be shown to the public. Extensive monitoring, guidance and tutoring will take place on all stages by groups. Edu Comelles lives and works in Valencia. He is a sound designer, musician and curator. He is currently involved in several individual and collective projects ranging from sound art, soundscapism and experimental music. His works have been shown and exhibited in institutions such as LABoral, Espai Rambleta, Caixaforum or Arts Santa Mónica in Barcelona, his city. His compositions have been broadcasted in various events across the world such as Ars Electronica in Austria, Tsonami in Chile or the MAMM at Colombia, among others. Comelles has released more than 20 releases with his solo projects or in various formations and collaborative projects. Labels like Fluid Audio, Spa.RK, Impulsive Habitat, Surrism, Mandorla are hosting his works on their catalogues. Solo and with collaborations he's been playing live at festivals such as Mutek Festival, Sónar, at the MNCARS in Madrid, MUAC in Mexico City, Fase Festival in Berlin or Eufonic in Barcelona where he also, with Cello + Laptop his collaborative project with chelist Sara Galán, played on Sonar Festival 2013. Since 2007 runs Audiotalaia an online platform or netlabel devoted to edition, production and promotion of experimental music and sound art under Creative Commons. Now a days he curates for the veteran Festival Ensems of Contemporary Music of Valencia. He has been the curator of Espai Sonor at EACC between 2016 and 2017. In Valencia, the city where he lives and works, he's been for 4 years the artistic director of the series of concerts Off_Herzios, organising more that 60 concerts in various venues and galleries across town. As an academic Comelles holds a PhD in Sound Art, and MsC in Sound Design by the University of Edinburgh and a Ma on Visual Arts And Multimedia Applications at the Polytechnic University of Valencia. He's also, with Fernando Ortuño, developing a research project focused on means to show, display and exhibit Sound Art in a exhibition context. This is happening at the Valencia Arts School. The Camp aims to gather young talented people from all over the world interested on sound and its creative possibilities. and with the aim to share and work collectively. All sessions will be held in english. A good level of spoken english is required to attend the camp and interact in all activities. We are looking after fine arts students, visual or sound artists, musicians, photographers, architects, anthropologists, documentarists, cinematographers, video-artists, designers or just simply people interested on using sound in their creative process. We are strongly encouraging people involved in sensory ethnography, anthropology or geography, as well as architects or students of architecture engaged on the study of landscape from an open perspective. The stay has been designed to take place in an intensive and collective experience at the El Polell facilities. The space: upstairs there are 2 rooms with 4 beds, one room with 5 beds, and one room with two beds and several bathrooms and showers. Downstairs a big kitchen, dining room, the tutor's room and the workshop. This 9 days stay at the Audiotalaia Summer Camp imply a certain level of compromise from the participants. Each of the 15 selected individuals will be split in teams and each of them will have assigned daily tasks. Those include, cooking, tiding up the house and cleaning. The tasks will be given through a schedule that will establish a proportional amount of work for each of the 3 or 4 groups. The participation includes the acceptance for part of the participants to collaborate daily with the basic tasks described above. Each selected participant will have to deposit 380€ through Bank Transfer (IBAN / SWIFT), or via Western Union or similar, we do not accept Paypal transfers. The amount covers for daily expenses, accommodation and access to all activities at the Summer Camp including the materials for the Microphone Workshop and the rest of activities. Each of the participants will have to travel by their own to Sant Celoni, the biggest town nearby El Polell with a train station straight from Barcelona City Center or Airport. At Sant Celoni transportation will be arranged for all participants to the house. At the end of the Camp transportation back to Sant Celoni or Barcelona (depending) will also be organized by the participants and the organization. The registration to the Summer Camp has two main steps. First each individual will have to fill the online form linked below. The Open Call form will provide us with background information on you. You will have to send a short motivation letter and minor information on your background and interests. We will carefully read and evaluate your candidacy in order to determine if you fit the profile. Once we close the open call we will select the best candidates to be part of the Summer Camp 2018. Notification via email will be sent to all applicants and the selected ones. Further instruction to the chosen will be sent at that stage. El Polell can host up to 15 participants at their facility. This means that once the registration of the applicants is done, 15 profiles will be selected and a list of substitutes will be kept just in case there are last minute drops.